As 2009 changes to 2010 I want tothank all of you for a wonderful year of training and personal exchanges onmartial arts, values, and life. Domo Arigato! 2009 was anotherbusy year. In terms of Bujinkantraining, our Buyῡ (Warrior Friends) group enjoyed a twelfth BuyῡCamp West in San Francisco under the Golden Gate Bridge on the Pacific Ocean, aswell as, a sixth Buyῡ Camp East in New Jersey. Buyῡ Camps are a great way to connect with old friends, get valuable "continuing education," and stay inspired to "keep going" when you get back to yourown training group. Click the respective Camp links for info on these yearly training opportunities; andcheck out our new Facebookpage to see pictures and comments. We had trainingseminars in NJ, California, Chicago, Michigan, Florida, Germany and the UK. It was great to hook upwith my friends Steffen Fröhlich and Peter King – both lifelong Buyῡ. Also had fun in Michigan with Craig Grayand his MMA professionals. We did another seminar in honor of myMarine Corps mentor, Robert L.Humphrey in NJ this past summer. We covered Humphrey's Life ValueTheory, warrior ethics, taijutsu, and the challenging and fun STRIKEtraining. 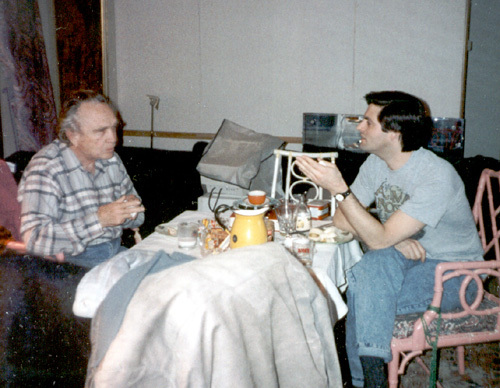 Bob Humphrey & Jack Hoban working on Humphrey's book "Values For A New Millennium." If you areinterested in Bob Humphrey's LifeValues teachings, we'll see you at the "Ethical Warrior" seminar again nextJuly in New Jersey. And please consult the WIN seminar page periodically for detailsof all of our Bujinkan workshops. New next year willbe several interesting training sessions that are a bit outside the scope of our"normal" Bujinkan training, So far we are planning workshopswith Bud Malmstrom, StephenHayes, Geoff Metcalfand George Thompson (VerbalJudo). These opportunities are offered through Resolution GroupInternational. If you are interested in further exploring the EthicalWarrior concept, or applying your training to law enforcement or militaryscenarios, or just want to work with these interesting men in a hands-onsetting, check out RGI Events. 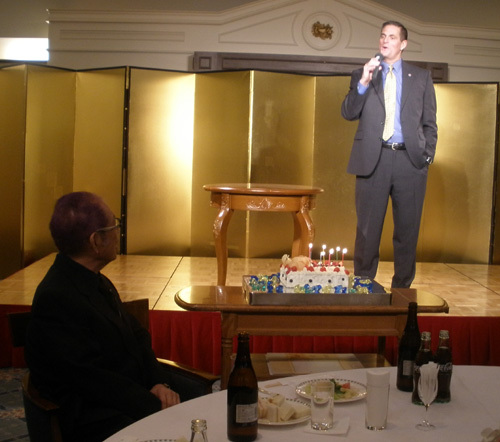 Singing "Happy Birthday"to Hatsumi Sensei at the Daikomyosai Party. This past year I wasagain privileged to work with the Marine Corps Martial Arts Program (MCMAP)in Quantico, Virginia. This fine program, led ably by my friend Joe Shusko (LtCol USMC ret.) 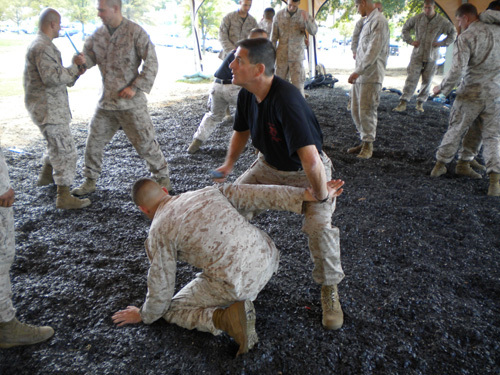 and MSgtTony Polzin covers thearmed and unarmed martial arts techniques and combat conditioning that a Marineneeds to walk the warrior path – both in combat and in daily life. These young Marines – many veterans of both Iraq and Afghanistan – are physically fitand mentally tough, yet respectful and ethical. The methodology we use issimple but vitally important: train a lot, talk a bit, train a lot, talk abit. 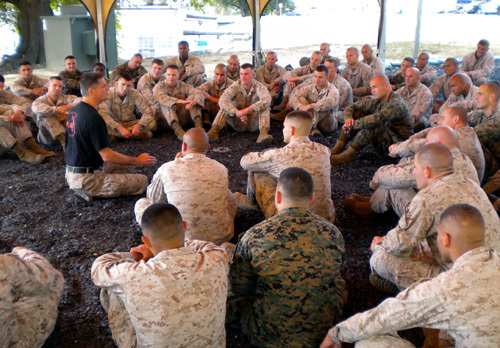 The Marines relish the physical training, and then are open to hearhow to use their training and ethics to maintain a professional "combatmindset" under the adversity of war. In martial arts training, it isoften easy to focus on the physical part while giving mere lip service to themental and character elements. But all three parts must go together. It seems that thisconcept of a total Ethical Warrior – protector of life – is starting to resonate with people. More about that downbelow. Which brings us to2010. In a recent letter Hatsumi Sensei included thispainting. The kanji, at firstglance, looks simply like the word "kanpeki," which means"perfect." However, Hatsumi Sensei's artwork can always beinterpreted in several ways. 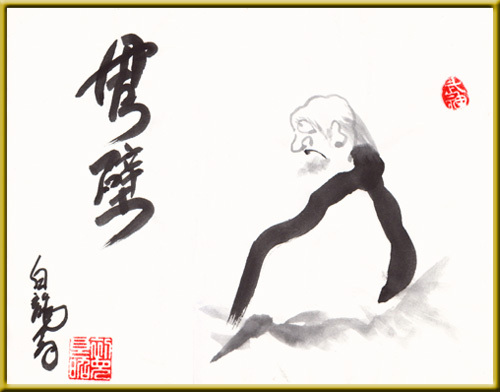 Looking at the painting, we see the founderof Zen ("Daruma" in Japanese pronunciation). It is said that he did "Shugyou"by sitting facing a wall for 9 years until his legs became useless and felloff. You may have seen the red, round Buddha-like dolls in Japanese shopsand households. sent to the other country to offer the stone in exchange for the towns. But the other King didn't look as if he were going to keep his promise. So the wise man said, "the stone has a scratch, I will show it to you." When the King handed back the stone to him, the wise man said, "I came here because my King trusted you and said that we shouldn't break our country's friendly relationship over a mere stone." He then escaped and returned the stone to his own King in perfect condition. He had also preserved the dignity of his country without surrendering to the more powerful country. Mission completed perfectly. So...perfect job, perfect condition – that is "kanpeki." Hatsumi Sensei,however, drops some strokes and now the kanji is 壁("wall"). So...in the picture, we have Daruma sitting in front of a wall and he may be trying to use his intention to pierce"through." But through what? Desire? To what? Perfection? Who knows? Perhaps pierce through the desires of the six senses (seediscussion of Rokkon Shoujou below). Only Hatsumi Sensei knows for sure.That is the fun and inspiring part of Sensei's paintings. What feeling doyou get looking at it? Maybe that is the real meaning. It has been announced that the theme for 2010 is "Rokkon Shoujou" (禄魂笑浄). This may refer to the Buddhist concept of "Rokkon Shoujou" (六根清浄") which originally means that we should not overindulge using our 6 senses (sight, hearing, smell, taste, touch and consciousness), but rather, purify ourselves from desire, perhaps by going into the mountains alone. As we see, Sensei has changed the kanji (as usual) so the meaning is...who knows what? "Receive happiness from heaven by cleansing one's spirit with laughter?" Again, only Sensei knows for sure. I guess we'll find out - if we keep going. We are also advisedto prepared to train with the "tachi" long sword. I amalways interested in swordwork for many reasons. First, the sword is theheart and soul of Japanese martial arts. Second, in terms of the tacticalaspects of martial arts, we see the sword manifest the purity of lines and spacein the fight – and on thebattlefield as a whole. Third, the sword represents the real fightdistance of a bayonet or pistol. I think we all could come up with manyreasons why swordwork is important and helpful in learning shiken gatatrue fighting. And, I suppose, that will be the essence of the training in2010. Let's enjoy it! The best way to keepup with Hatsumi Sensei is doing is to go to Japan, ofcourse. But, between trips, I highly recommend Doug Wilson's blog. There is also a lot of good information on Joji Ohashi'ssite here. 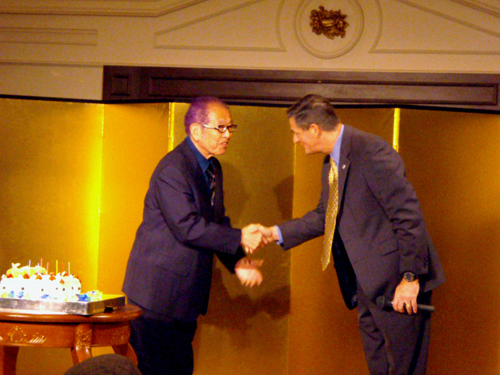 As I have said manytimes, I began my training with Hatsumi Sensei when I was 25 and he was50. During my recent visit to Japan it became clear to me within the first10 minutes of training, once again, that Hatsumi Sensei is still 25 years ahead. The "theme - no theme" of 2009 in Japan evolved into 才能心器(sainou - ability, shin/kokoro - heart, ki/utsuwa - capacity) with a heavyemphasis on "connectedness." It made me think about how we muststrive to use our abilities to stay connected to the heart of the Bujinkanteachings according to our own personal capacities. As readers of thisyearly message know, in order to maintain the "thread" that reaches toHatsumi Sensei across the 25 year differences in my training and lifeexperiences, I create a Buyῡ theme each year to try to help "connectthe dots." This year I amlooking at the san shin in terms of "techniques, tactics andethics." As we saw last year, the 5 movements of the san shin nokata (三心之型) havelessons that are both "technical" (as in the techniques of punching,kicking, moving, etc.) and "tactical" (as in timing, distance, andcontrol of the tactical space). This year I would like to explore the"ethical" lessons within the san shin no kata, as well. At the Daikomyosai this year Hatsumi Sensei stressed that we have to "takecare of our opponent." Was he merely referring to our trainingpartner in the dojo? Or, was he referring to a real attacker? I believehe meant both. If that is the case, then, what are the elements withinthe techniques themselves that protect life – our own, ofcourse, but also our opponents? I believe that an exploration of these lessonswill lead us toward our goal of being Ethical Warriors, and ultimately, awarrior's enlightenment. What are EthicalWarriors? 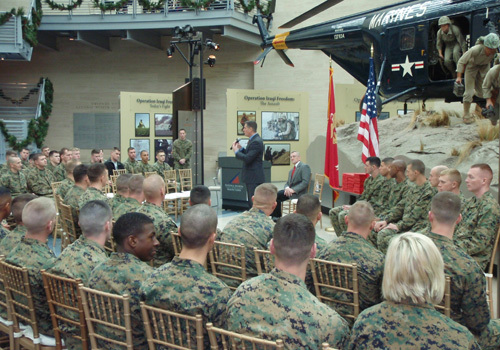 In a speech I gave at the MarineCorps Museum in Quantico, Virginia on December 18, 2009 I used thesewords: "The Ethical Warrior is a protector of life. The EthicalWarrior is not just a fighter, although we do fight of course. Not merelya killer, although we may be called upon to kill. The Ethical Warrior isfirst and foremost a protector – a protector of our country...of our friendsand allies, protectors of the innocent – and sometimes not soinnocent....[And] yes, sometimes we are also protectors of our enemies. An oxymoronic-sounding concept forsure, but that is why it is so anti-intuitive and a secret. Protectorsof self and others. Which others? All others. If we can. That’s what we do." Killing only to protect life. Cleanse your mind of everything else. That is the morality of the warrior. You cannot take a predatory approach, because you are not a predator. You are a protector. You have a conscience. Turn it on – don’t try to turn it off. People may say: “That’s soft;warriors have to deal with hard people. You will make the students weak or hesitant or'too nice' with that approach.” Wrong. That is like saying that the protective nature of aFather for his son, or a Mother for her children, or a Marine for his men, makes them weak. In fact, extending our protective inclinations wider and wider helps us become stronger, not weaker. Safer, not more vulnerable. Martial arts is not justfor protecting the body anyway; in war you have little control over what happens to your body. In fact, the greatest warriors are often killed, because they have to lead and do the difficult things most cannotdo. But what if you don’t die? What if you live? That is the hardest part – to live after doing what had to be done. So, true warriortraining has at the core, most importantly, methods to protect the mind and spirit in case you live. The physical techniques and tactics may protect the body; but the ethics protect the soul. It’s a good lifebeing a protector, a better life. But it is still dangerous. That iswhy we will work hard to hone our martial arts skills. All of them. That is ourmission for 2010. To explore the life preserving wisdom of our art withinthe techniques themselves. Gambattemashou!